Cinderella (Traci Allen Shannon) flees the ball. Photo by Dan Norman. 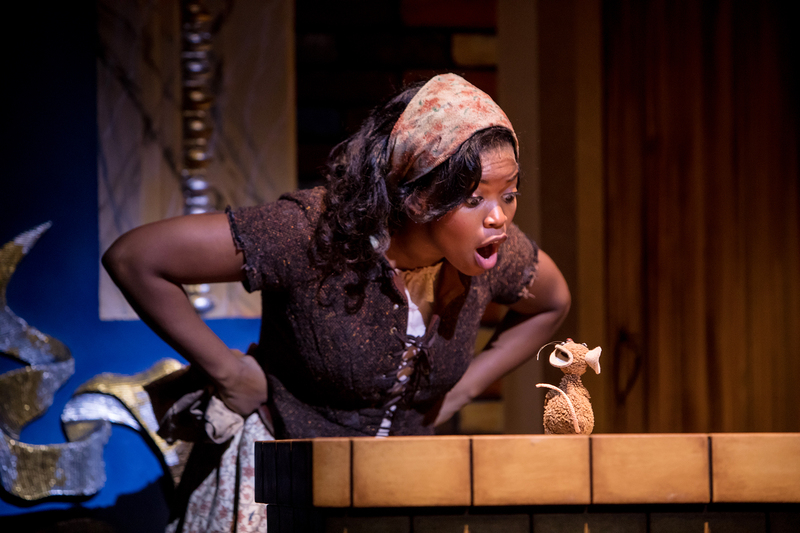 Cinderella (Traci Allen Shannon) has a word with a mouse. Photo by Dan Norman. A Victorian Christmas, a vaudeville show, and a romance are all encompassed in the Children’s Theatre Company’s latest production of the fairy tale Cinderella. It is a remount of the show that CTC performed during the in 2013-2014 season with many key actors reprising their roles. Director Peter C. Brosius directs a talented cast in this John B. Davidson’s adaptation of Charles Perrault’s original fairytale. 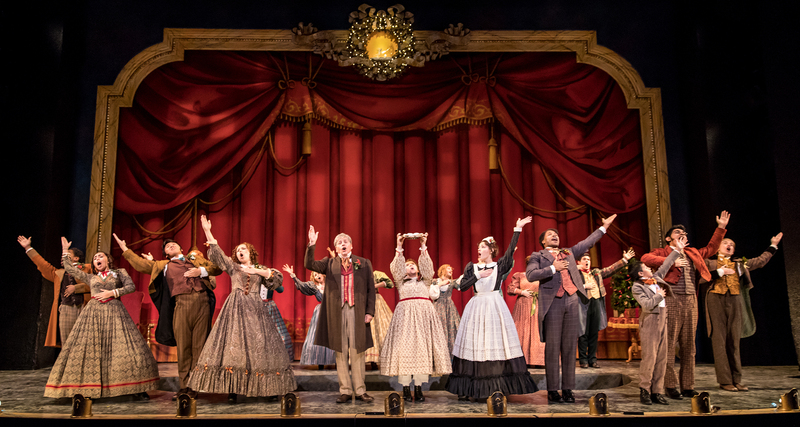 The play opens with a Victorian Christmas party setting with actors and costumes that look as though they are on loan from the Guthrie’s Christmas Carol. 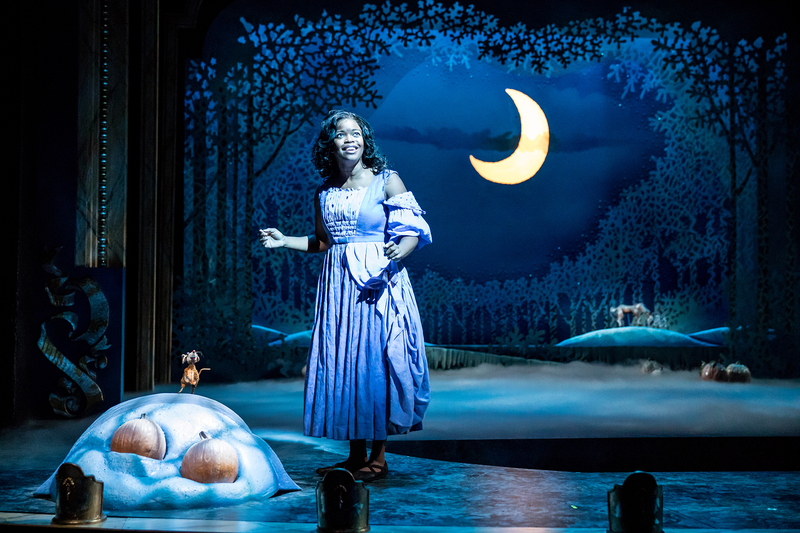 Between Christmas songs and joking, the family patriarch tells the children the story of Cinderella. The scene then shifts to the home of Cinderella’s stepmother (Autumn Ness) and her two stepsisters Pearl (Dean Holt) and Dorcas (Reed Sigmund). The opening scene at the home is the equivalent of a vaudeville act with Holt and Sigmund picking on each other in a catty fashion. They dominate the scene to the point where Cinderella seems like an afterthought. 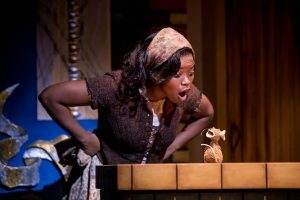 Cinderella finally gets some center stage time when she works with the household mice and rats to do her chores in the hope that she gets to attend the Prince’s ball. But before we get to the ball, the show shifts back to the Christmas party and then, again, to antics of the stepsisters. After the bell of midnight… Photo by Dan Norman. Traci Allen Shannon as Cinderella gets to shine when her stepfamily refuses to take her to the ball and she is left behind and heartbroken. With the help of her Fairy Godmother (China Brickey), she is able to attend the ball with a lavish gown, a coach and footmen. At the ball she meets Prince Eric, played by the charming David Murray. Shannon and Murray are the perfect couple as they dance until the stroke of midnight. Before the play comes to its inevitable happy ending, there is another round of both Christmas party and stepsister antics. Shannon and Allen, who recently played a doomed couple in Theatre Latte Da’s production of Ragtime, play the royal couple. The hallmark of Shannon’s performance is her powerful singing and Murray plays a charming prince who is overwhelmed with the attention he receives from the ladies at the ball. Ness, Holt and Sigmund are hilarious with their slapstick humor and bawdy comedy. 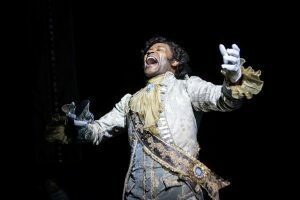 The Prince (David Murray) gets excited. Photo by Dan Norman. The show adds some inventive audience interactive devices including the playing of Pokémon Go, the use of audience cams, and giving the audience a buzz word for standing up and shouting. Although the show is listed for all ages, the show’s multiple layers become difficult for those less than 7 years of age to follow. The show is nearly at the 30 minute mark before Cinderella plays any meaningful role and, prior to that, my four-year old granddaughter kept asking me when Cinderella was going to get to say something. The gunshots in this first part of the show were also upsetting to the little ones with many covering their ears. The play would definitely benefit from trimming some of the vaudeville antics, especially in the beginning, so that the story of Cinderella can have equal time. Among the splendors in the show include Eduardo Sicangco’s scenic and costume design. Cinderella’s ball gown was breathtaking and the costumes for both those at the Christmas Party and the Ball were intricate in detail. The most spectacular scene was when the pumpkin stagecoach arrived on stage. Victor Zupanc’s music direction, composition, and orchestration of relatively recent pop songs also added to the show’s fun. But ending the show with the children’s favorite “YMCA” seemed like an odd choice. Zupanc’s Canadian heritage also was the subject of some of the best jokes in the show. The cast of Cinderella. Photo by Dan Norman. Older members of the audience (7 years and up crowd) had great fun at the show. When my granddaughter first saw the show, it was not a complete hit with her. But it is not a complete loss with the younger group. With the passage of a few days, my granddaughter now repeatedly brings up how she liked the show and she wants a dress like Cinderella’s.